Two projects, which received funding support from Northern Ireland Screen, have been selected to screen at this year’s Hot Docs Canadian International Documentary Festival in Toronto. The annual festival takes place between Thursday 25 April until Sunday 5 May 2019. Feature documentary BOJAYÁ: Caught In The Crossfire is set to screen on three dates across the festival. The film, which received funding support from the Northern Ireland Screen Fund and The Arts Council of Northern Ireland, was produced by Belfast-based production company Fine Point Films. BOJAYÁ: Caught In The Crossfire details the 2002 Bojayá massacre in Colombia, which is cited as one of the worst atrocities in Colombia’s 50 year-long conflict. More than 79 people died when the Revolutionary Armed Forces of Colombia (FARC) launched a homemade mortar onto a church where many were hiding from crossfire between the left-wing FARC and right-wing paramilitaries. When peace between the government and the FARC was signed in 2016, after decades of conflict, Leyner made it his mission to ensure the peace deal was implemented to his people’s benefit, receiving a Nobel Peace Prize in the process. Capturing one victim’s incredible struggle for justice, this film follows the process of identifying the dead of Bojayá during the faltering implementation of the controversial peace accords. The film, which was produced by Trevor Birney and Brendan Byrne, is director Oisin Kearney’s first feature documentary. Short film EL HOR, which was written and directed by filmmaker Dianne Lucille Campbell and produced by Out of Orbit’s Brian Falconer, has also been selected to screen at Hot Docs. The film documents the unique relationship Dianne shares with her two rescued Salukis – Rutger and Günther, and the life journey they have taken her on. The Egyptians held the Saluki in the highest regard, the dog was believed to be the intermediary between worlds, deciding whether you were worthy of the afterlife. 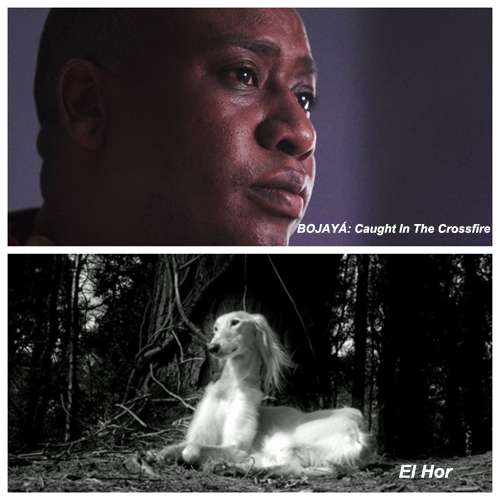 EL HOR was developed through the Scottish Documentary Institute’s “Bridging the Gap” programme in 2018. The acclaimed training initiative is one of the leading documentary new talent initiatives in the UK, offering intensive training and commission opportunities to emerging UK-based filmmakers. Bridging the Gap receives support from Northern Ireland Screen, Creative Scotland and the University of Edinburgh. For further information on Hot Docs, click here.